Copyright �2017 PopEntertainment.com. All rights reserved. Posted: February 3, 2017. 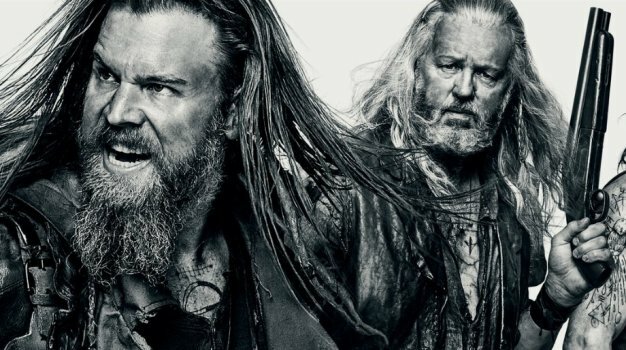 Just like its name suggests, the WGN's series Outsiders is definitely something that engenders risk; it, so to speak, sits "outside" of expectations. Think about it: a weird community in the hollers of Kentucky resists efforts to corral an extended family by local law enforcement and societal conventions, all the while keeping their clans together. In Outsiders the story of the Farrells unfolds � a family clan who have been in rural Kentucky since long before the modern world had intervened. Living off the grid and outside of established law on their mountaintop enclave, they protect their world from society's intrusions and defend their way of life using any means necessary. A struggle for power and control ensues in these rugged and mysterious hills of modern-day Appalachia, both within its insular community and coming from the normal world beyond it. 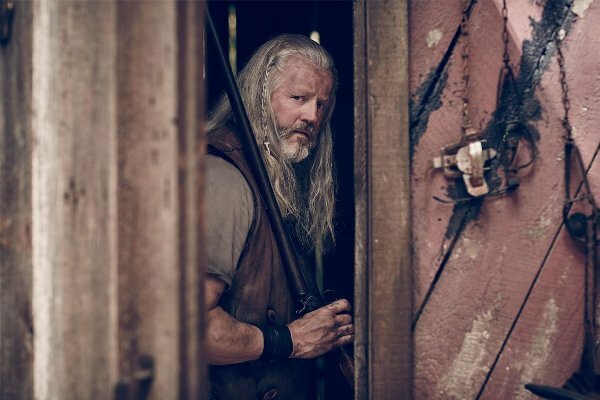 The ensemble cast for Outsiders includes: David Morse as Big Foster, Ryan Hurst as Lil Foster, Thomas M. Wright as Sheriff T. Wade Houghton; Gillian Alexy as G'Winveer; Kyle Gallner as Hasil; Christina Jackson as Sally-Ann; Joe Anderson as Asa; Francie Swift as Haylie Grimes; and Rebecca Harris as Ledda. The challenge faced by both creator/executive producer/writer Peter Mattei and Executive Producer Peter Tolan was profound: How do you create characters that audiences would identify without them becoming a parody? With intriguing story lines, a set of complex characters and a locale rife with its own history, the show has found a large enough audience to launch a second season this January. Last season, Big Foster, the Farrell family patriarch, was shot and left for dead. Certainly it doesn't hurt to have him be played by such a craftsman as David Morse. Born in Beverly, Massachusetts, this 63-year-old studied at the William Esper Studio after high school and went on to star in the television series St. Elsewhere and Hack. In 2002, Morse was nominated for Best Supporting Actor at the Golden Horse Awards for the crime-drama Shuang Tong. In 2007, Morse appeared as the creepy Mr. Turner in Disturbia, starring Shia LaBeouf. His other notable films include The Negotiator, The Green Mile, 12 Monkeys and The Long Kiss Goodnight. Morse was also seen in acclaimed Emmy nominated Treme and received Emmy noms for his work as George Washington in the HBO mini-series John Adams. In this set of one-on-two pairings, he's joined by Ryan Hurst as Lil Foster, who provides a contrast to the headman. Considered a gentle giant, he's determined to be his own man. This Californian previously had established himself as Opie Winston on the hit series, Sons of Anarchy, and was seen regularly in Bates Motel, Medium, King & Maxwell and Wanted. The 40-year-old also starred in Taken, a Steven Spielberg sci-fi miniseries. The 6'4" actor got started in film opposite Denzel Washington in Remember the Titans. He also appeared in Saving Private Ryan, The Ladykillers, We Were Soldiers, Patch Adams, and Rules of Engagement with Samuel L. Jackson. You're the father figure and the son. What do you do to feel familial? 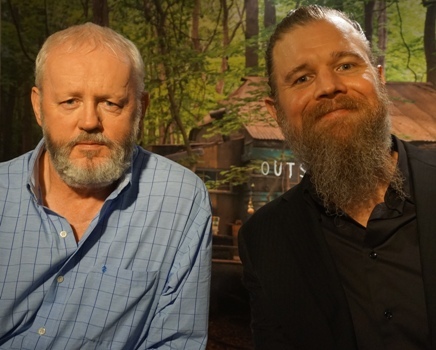 David Morse: In terms of feeling comfortable with each other as actors? Ryan Hurst: Lots of hot tubbing. That was fun. You're also figuring our your relationship with your characters. Do you get together to figure that out? David Morse: It's in the script. That's just there as a given. We give ourselves over to it naturally. Just being with each other goes a long way. We spend a lot of time together on the set; we got a good feel for each other pretty quickly. It just grows as you do it. 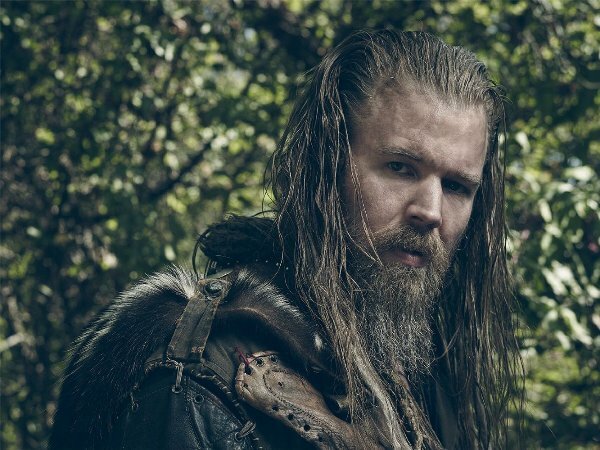 Ryan Hurst: David was attached to the project before I was. I've played someone's son before, but when I heard he was attached I wanted in on the project. It was the first other actor I saw that I thought even I would believe I was their son. So there's a resonance there. Have you any comments on your own sartorial qualities � your hair and beards? Ryan Hurst: I do his hair. He grooms my beard. That's what we do every morning. David Morse: When I was first cast, we didn't know what the look of the Farrells was going to be. I did something � True Detective � where I had long hair. I sent a picture to the producers and they thought it was great. We needed a look so when people go into town and say, "These are the Farrells," they know it when we walk in. As far as the tattoos [are concerned], this man is responsible for the work with tattoos. From all of us blooms these rituals and things as we do in this first season. Both of you have done series and films where you play outsiders. Did that help inform you? Ryan Hurst: Doing the first season, one of the things that helped us is that a biker gang is like a secret society. There's going to be things, be they handshakes or gestures or sayings, that delineate us from them. That was a conscious effort on all our part. The day we were supposed to shoot Lady Ray (Phyllis Somerville) coming into the barn, David said, "I think we should have some type of gesture, or bowing to her." So it was David, me, and Kyle [Gallner], and we sat there and went "what about this? Or this?" And David was like "what about this?" and we went let's do that. David Morse: I am drawn to people who are outside what feels like the normal world [anyhow]. It's much more interesting to be out there. That's part of what we're all drawn to in this, the out there. It's not familiar. You two have a particular arc with its own special dynamic. How did that evolve and interweave? David Morse: He was being so abused by my character in so many different ways over the years, he is the one who is sent to find me. That connection is deep, and there's a lot that comes from it over the course of the season. #1 � 2017 Brad Balfour. All Rights Reserved. #2 � 2016. Courtesy of WGN America. All Rights Reserved. #3 � 2016. Courtesy of WGN America. All Rights Reserved. #4 � 2016. Courtesy of WGN America. All Rights Reserved.